The term Devi represents the divine power that has taken the passionate (raajasic) form to suppress the forces of evil and protect the serene (satvic) qualities. 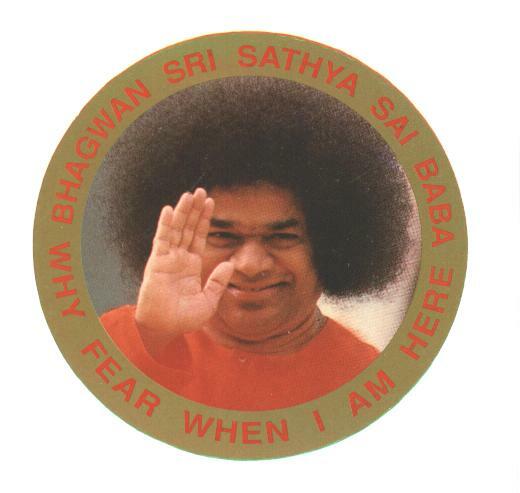 When the forces of injustice, immorality, and untruth have grown to monstrous proportions and are indulging in a death-dance, when selfishness and self-interest are rampant, when men have lost all sense of kindness and compassion, the Atmic principle assumes the form of Sakthi, takes on the passionate (rajasic) quality, and seeks to destroy the evil elements. This is the inner meaning of the Dasara festival. When the Lord metes out a punishment, it may appear harsh. But what appears externally as passionate (rajasic) is in reality serene (satwic). In a hailstorm, along with rain there will be hailstones. But both the rain and hailstones contain water. Likewise, there is serene quality even in the Lord's passionate actions. Similarly there may be passionate quality even in slothful (thaamasic) actions. These depend on the time, place, and circumstances in which the Lord acts. Butter can be split with a finger. But a powerful hammer is needed to break a piece of iron. The Lord deals with serene persons in a serene way. He applies the passionate weapon against passionate persons. People worship the Lord as Roudrakara, attributing dreaded forms and qualities to the Divine. This is not proper. The Divine has only one attribute: the embodiment of love. It has been said, "Love is God. Love pervades the Cosmos." Hence, one should not view the world from a worldly point of view. It should be viewed through the eyes of love. All the festivals of Indians (Bharatiyas) have been designed to promote divine love among the people. It is to confer such love on the people that the Lord incarnates on earth. He Himself demonstrates how love should be expressed. He showers His love and teaches everyone how to love. Hence, experience this love and joy in your life and live in peace. Indians (Bharatiyas) have been celebrating the Navarathi festival from ancient times as a mode of worship of Devi, the Divine as mother. They worship Durga, Lakshmi, and Saraswati during those nine days. Who are these three? These three forms have fascinated man. Their esoteric significance is represented by three potencies (sakthis): karma, devotion (upaasana) and spiritual wisdom (jnana). The significance of Durga, Lakshmi, and Saraswati has to be rightly understood. The three represent three kinds of potencies in man: will power (ichchaa sakthi), the power of purposeful action (kriya sakthi), and the power of discernment (jnaana sakthi). Saraswati is manifest in man as the power of speech (vaak). Durga is present in the form of dynamism. Lakshmi is manifest in the form of will power. The body indicates purposeful action (kriya shakthi). The mind is the repository of will power (ichchaa shakthi). The Atma is the power of discernment (jnaana shakthi). Purposeful action comes from the body, which is material. The power that activates the inert body and makes it vibrant is will power. The power that induces the vibrations of will power is the power of discernment (jnaana shakthi), which causes radiation of energy. These three potencies are represented by the mantra, Om Bhur Bhuvah Suvaha. Bhur represents the earth (bhuloka). Bhuvah represents the life force, conscience in man. Suvaha represents the power of radiation. All three are present in man. Thus, Durga, Lakshmi, and Saraswati dwell in the human heart. Men are prone to exhibit passionate (rajasic) qualities like anger and hatred. They are the menacing manifestations of Durga. The extolling of the Divine in song and poetry and the pleasing vibrations produced by them indicate the power of Saraswathi. The pure qualities that arise in man, such as compassion, love, forbearance, and sympathy, are derived from Lakshmi. What should do during these ten days of the Navarathri festival? Convert your will power (ichchaa shakthi) into a yearning for God. 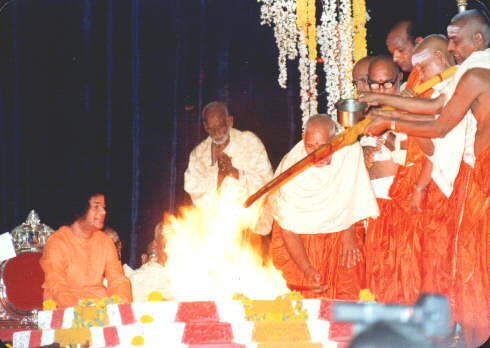 Convert purposeful action (kriya sakthi) into a force for doing Divine actions. Convert your power of discernment (jnana sakthi) into the Divine Itself. Navarathri means "nine nights". What does the nine signify? There are nine planets (grahas), according to astrology. The human body has nine openings. If a deep inquiry is made, it will be found that mankind is dependent on the planets. Although astrologers speak about nine planets, in reality, only two "planets" matter: attachment (raga) and hatred (dwesha). Therefore, the Navarathri festival is observed by contemplating on God for ten days, cleansing one's self of all impurities, in order to experience the divinity within. The penultimate day of the festival is dedicated to what is termed "worship of weapons (ayudha puja)". The weapons to be worshipped are the divine powers in man. When the divine is worshipped in this way, one is bound to progress spiritually.